When it comes to troubleshooting a network or internet connection there are several possible ways to do it. 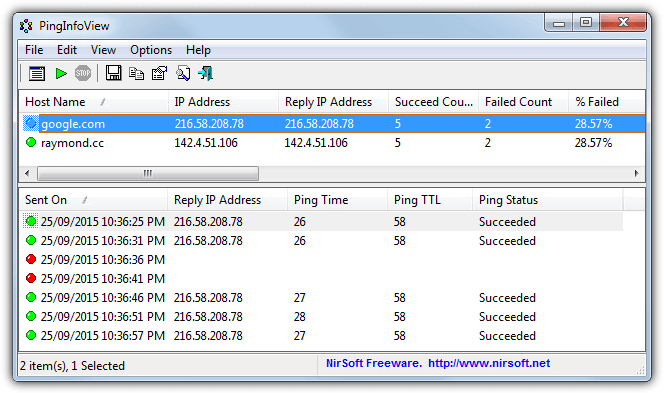 One of the simplest is to use the built in Windows Ping utility to ping another computer because it can quickly help determine if there is a connection between the host and a remote computer. Not only can it help you identify local network issues, the Ping command can also be used to test the uptime of a remote IP address, server or website. Ping does the job it’s designed for and is run from the command line or batch scripts, so you have to supply a number of arguments to get the best out of it. Although powerful enough for most uses, one option missing from the Window Ping tool is the ability to include a time and date so you can see what the response from the destination is and the exact point in time it was received, which is useful if you want to continuously ping over a prolonged period. In the screenshot above, you can see Windows Ping does not show the date and time in the ping results. In addition to a timestamp, it’s also useful to be able to continuously ping for reliability over a period of time and optionally send the results to text file for logging purposes. 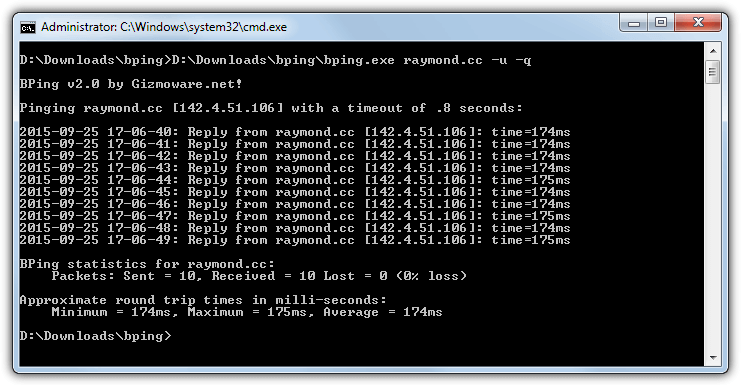 Here we show you 6 ways to timestamp pings as well as sending a continuous set of ping results to a text file, make sure to run Command Prompt or batch files as Administrator to avoid issues..
hrPing is by cFos Software who develop the cFosSpeed internet accelerator application. The hrPing tool itself is one of the most advanced of its type and allows you to configure just about anything you want with regards to what you ping, how often you ping it and when. There are around 40 different command line arguments available so reading the documentation is recommended. Luckily you only need a few of the available arguments to ping with a timestamp and optionally send the results to a text file. Use -t to loop the ping until you manually stop it, -T adds the time and date stamp while -F [filename] allows saving the output to text file (include -q to output only to file). To ping a specific number of times instead of continuously substitute -t for -n [number], also you can use -s [milliseconds] to slow the ping frequency down from half a second to something a bit slower. An additional argument of -gg will open a separate window with a small graph of ping response times, useful if you have particular interest in the speed of the ping responses. For a bit of fine grain control over how and what data to send in a ping, Fping is a good choice because it has quite a few options to configure the process for custom pinging. These range from pulling a list of hosts from text file, using ICMP or RAW socket ping to supplying the amount and content of the data for the ping. Arguments for basic time stamping of the ping command are easy to understand, add a time to the command by using -T, -D will also include the date. Outputting the data to a text file is done with -L and the file path/name. By default Fping will ping the address 4 times like the internal Ping command, to ping continuously until you manually stop it using Ctrl+C, add -c or -n [number] will ping the number of times you specify. A tool called VPing is available on the website that has a user interface so you can ping from several hosts at once in a window, although it only works on 32-bit Windows. PingInfoView by Nirsoft is a little different to the other tools because it works from a graphical user interface. This makes it easy to spot ping errors more quickly if you are actively monitoring and watching for issues because they will show up in the user interface as red entries. On launch PingInfoView will popup a window where you can add one or a number of addresses to monitor, the ping timeout and the repeat rate (default is to ping every 5 seconds). Press OK and the main window will show. The upper pane is the monitored hosts list with statistics about the ping results like success/fail rates, min/max/average times and succeed/fail times. Click on a host in the top pane to show the the individual time stamped ping results at the bottom as they come in. When you have finished monitoring press the Stop button on the toolbar. The lower pane results can be saved to text file, click on any entry and press Ctrl+A to highlight everything, right click and choose Save Selected Items, then save as a tabbed text, delimited text or HTML file. By default Bping will give an audible beep (or use a custom WAV file) every time it pings and receives a reply, which is useful if you are testing and not looking at the screen. If the Bping output is being redirected to a file, it can be left to beep or you can turn it off. It can also scan for and show other computers on the network with the option to show freely available IP addresses. To add a timestamp to the command use the -u argument, -q will disable the beep if you find it annoying. Bping will ping Google DNS (8.8.8.8) if you don’t supply an address or hostname. As there is no command to output to file, redirect the results using >filename or >>filename to append to an existing file. A couple of other useful commands are -d which will only beep if the ping fails, and -n which will allow a defined number of pings (e.g. -n=500). If you don’t use the number option the Bping command will have to be exited from the command line with Ctrl+C because it will continuously ping until you exit the program. For ease of use it doesn’t get much simpler than PingWiz because it’s like a cut down version of the Windows ping command that timestamps each ping request automatically without additional arguments. Simply use pingwiz [hostname] and it will add the time and date with pinging the host four times. Adding /t will loop the pings continuously until you press Ctrl+C or /n:[number] will ping the specified number of times. A manual redirection to an output file is required. There are actually only two other commands available in PingWiz in addition to those above, the ping timeout in seconds (/w) and the number of bytes to send (/b). Although the Windows Ping command has no built in function to date and timestamp the result of each ping, with a bit of effort you can get it to do that, handy if you specifically need to use the Windows Ping command. The following was found on StackOverflow and looks complicated but seems to work quite well. The above will continuously ping the address with a time and date and an output log file, press Ctrl+C to end the session. If you wish to add the line to a batch script substitute the "%a" for "%%a" in the middle of the command. There are of course variations of inserting the time and date into the Windows Ping, if you know of a better way to implement the command then please let us know. Nice, but it would be nice if it output to screen AND text file, like your example shows. I only get it to text file. It would help if you said which method you are using, there are 6 of them. Excellent been looking for something like this for weeks! Great job! I love the built in cmd, way number 6th. Great post easy to follow. This was a lifesaver, thank you. Thanks :) You helped me. Well, hrPing is not doubt good comparing to Windows Command Prompt but it have a big drawback of causing High CPU Usage nearly 90-100%. Due to this other programs performance are effected and work slowly. Nice ping tool. But I personally have been using fping by kwakkelflap. Bit “above my pay grade” this – but a good find and have added it to my toolkit with the explanatory text from their website. Thanks Raymond. Jason admires this blog. Why didn’t I find it before? that is a nice find Raymond.